A couple of contributors to the Stop Penneast pipeline Facebook page (https://www.facebook.com/stopthepenneastpipeline) pointed out a presentation given by the FERC Office of Energy Projects last fall at the Maine Natural Gas Conference. 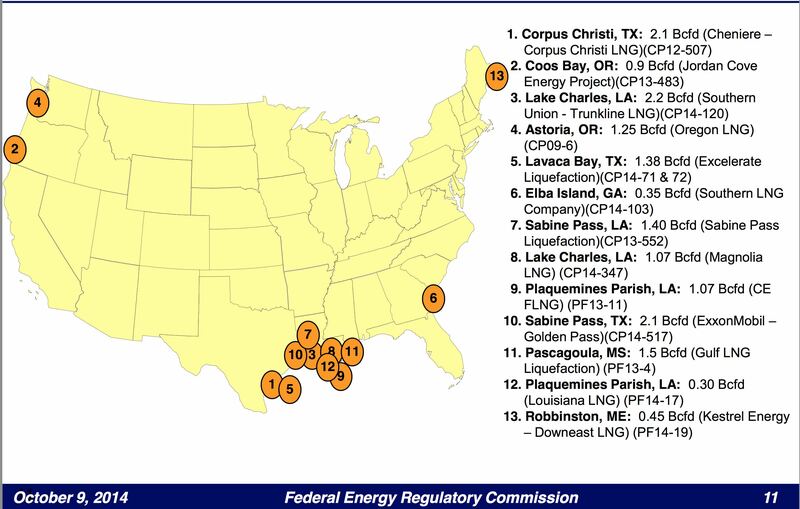 This presentation (available here) shows that FERC is indeed a cheerleader of the natural gas industry, and the purpose of this presentation seemed to be to help companies maximally exploit natural gas reserves all over the country. There are a few smoking guns in this presentation. 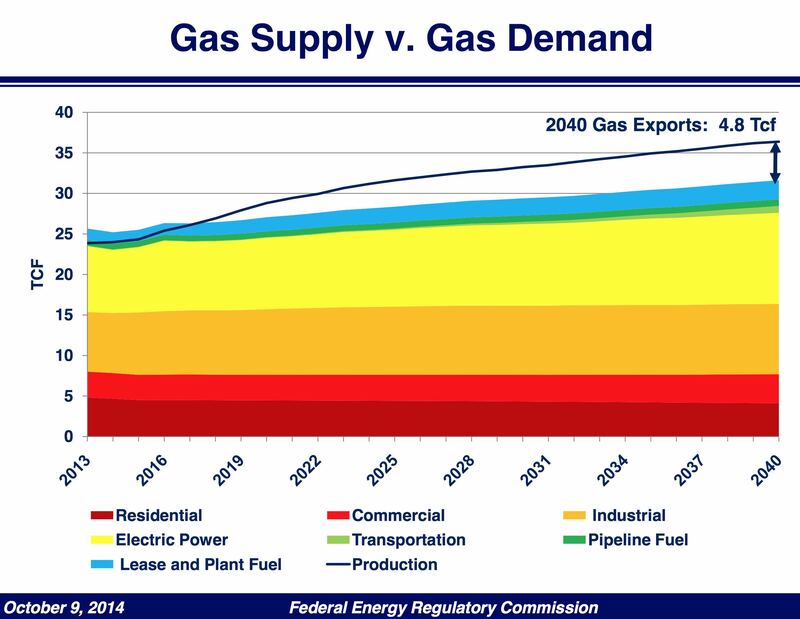 Smoking Gun Number 1 – FERC knows that demand for natural gas in the US is very low. And will remain so for the foreseeable future. Residential use of nat gas – flat. Lease and plant fuel – flat. Transportion – very moderate growth. Electric power – moderate growth. Exporting gas to foreign countries – massive growth. Basically FERC is acknowledging that there is only one growth opportunity in the US for natural gas – electrical power generation. This will grow modestly as power plants convert from coal to natural gas. But this is only a modest gain, and cannot account for the billions of cubic feet coming out of regions like Marcellus every day. FERC knows the only place for the majority of this excess gas to go is to exports. This will be massively profitable as natural gas is extremely expensive in places like Asia. If you live in NJ and PA – this gas will not materially benefit you. FERC knows this. And I have bad news for all the people cheering the pipeline companies because you think your gas prices are going to plummet: they’re not. In fact, research and common sense says that your gas prices are likely going to climb modestly. This is basic economics. Consumption is flagging in the U.S. Demand is surging in natural-gas poor areas like India and Asia. Natural gas is very expensive there. So the natural gas companies will maximize their profits by getting as much gas to expensive areas as possible. A side effect of this is that your residential rates will go up slightly, because no one will want to ship gas to cheap residential customers when the LNG export stations are begging for suppliers. They know it and they trumpet it loudly. They purposefully evaluate them in isolation but they know these pipelines are all connected and are part of a master plan of the FERC and energy industry to maximize profits, but if they evaluated them together the ecological impact would be obvious and overwhelming. Only by evaluating them individually can they hope to slip this past residents and state DEP officials. Look at that slide – it’s absolutely outrageous. 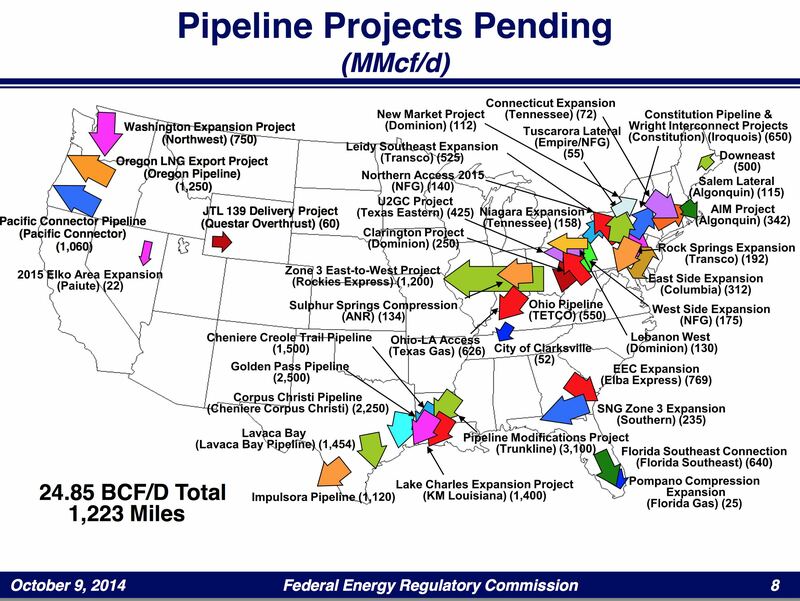 Pipelines are criss crossing the country in this picture, and FERC is extremely satisfied with this result. Firms like Spectra Energy, a Penn East partner, crows about running pipelines all over the country to get gas “where the lights are”. What they mean is “where they can make the most money” – over seas. 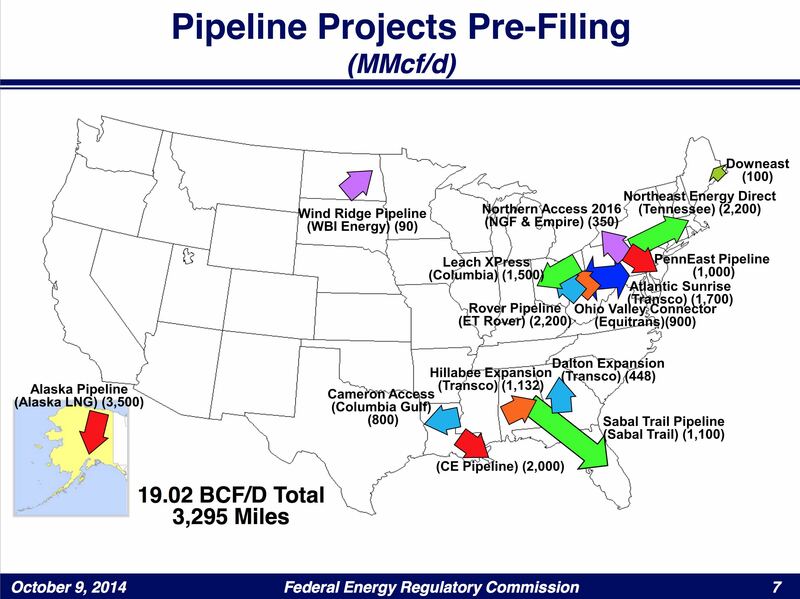 FERC knows there’s nowhere for all this gas to go in the U.S. They know the purpose of all this pipelines is to get the gas to facilities to turn the product into liquid natural gas (LNG) and ship it overseas. LNG is 600 times denser than nat gas in its natural state, so it’s highly efficient to ship it by LNG cargo ships this way. 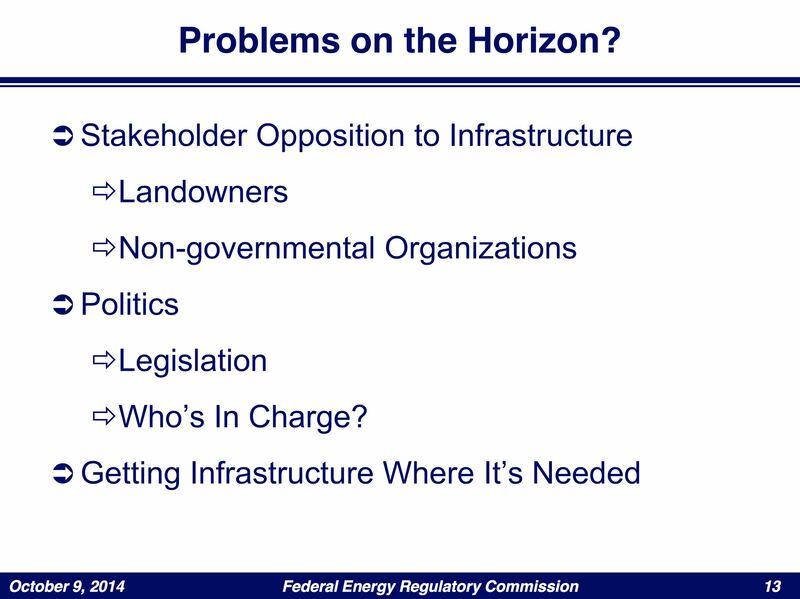 The ones in this slide are on top of the 4 LNG export stations already approved by the FERC. And there’s another slide showing 13 more! If you are worried about this pipeline, FERC sees you as the enemy. You are a negative issue they must work around. You are an impediment to them helping gas companies reap billions of dollars from Marcellus shale. You an annoyance that irritates them and they really wish you would just go away so they get on with their jobs. The final insult – there is not a word in this document about the ecology, conservation, or safety. It is abundantly clear that FERC is a cheerleading organization who sees its mandate to facilitate big energy companies in any way they can. This isn’t about infrastructure for America. This is about money and profits for large industries. There are things we can do collectively to help stop this pipeline and the many others like it. Talk to your government representatives. I think it’s clear that the laws have to change. The FERC should not be the sole agency in charge of approving pipeline and LNG projects. They are clearly not willing or capable to do the environmental surveys that they are required to. Write your Congressmen and Senators and demand that other agencies such as the EPA have the right to shut pipeline approvals down if they do not meet their standards. Demand that the Clean Water Act be upheld. Hold the government and the pipeline companies accountable. Demand funding for government oversight. Demand a tax on pipeline companies to fund more government regulation in the approval phases and oversight phases. Make them pay for the cost of these pipelines in full so we can ensure they are safe and ecologically sound. This will not bankrupt them. The whole FERC budget is a mere $175 million. This is a trillion dollar industry we’re talking about – a mere 1% tax would barely dent their budgets but would fund oversight quite easily. If the FERC approves this pipeline, urge your town, county, and state to sue the FERC for violating their mandates. It’s been done before and people have won. Don’t give into the FERC and PennEast. Fight for your rights. Deny them access to your property, do not let them buy an easement. Force them to sue you. If enough people force PennEast to court it is likely they will just walk away, or at the very least choose a more sensible route that does not impact so many farmsteads, preserved areas, and ecologically delicate locations. Talk to your DEP representatives. They are our last line of defense. Even if FERC approves this pipeline Penn East must get approval from them before they can begin construction. Urge the DEP to hold PennEast to the letter of the law and protect our category 1 streams, our watersheds, our grand rivers like the Delaware. Keep submitting to the FERC. Keep demanding to be heard. Keep up the protests. The FERC has noticed – and it’s worried. It’s worried congress will act and strip them of their regulatory approval capabilities. And they are right to be worried. Help make their fears a reality.